This month we’re highlighting a community that is showcasing their commitment to cyclists. 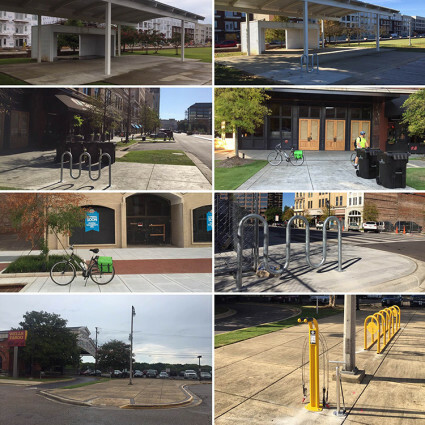 Montgomery, Alabama, recently installed a handful of new parking racks for riders in their city. From a brewery to the local farmer’s market to a community garden, Montgomery riders can now safely park their bikes at some of the city’s most frequented locations. To learn more, we interviewed the driving force behind Montgomery’s efforts, Deana Acklin. Why did you choose to add bike parking to your city? As an avid cyclist who rides for fitness and as a commuter on a daily basis I am very familiar with the rewards of cycling. BICYCLES BRING PEOPLE TOGETHER. Biking encourages discovery and spurs community engagement. Bicycling is a simple solution to many problems that are evident right here in our region, from reducing obesity rates, to cutting parking congestion, to increasing mobility options. There is a large population of Montgomery residents that are commuting by bicycle every day. Whether it’s a commute to work, trips to the local coffee shops, or picking up groceries…they are moving two-wheels at a time! However, an overwhelming concern by riders and local businesses is the absence of bicycle parking in our great city. Aside from the beautiful racks along the Civil Heritage Trail, there aren’t many options for riders to securely park their bicycles downtown or in the neighboring business communities. My goal was to be able to give the community the bicycle parking options needed for our daily commuters and for those who just want to ride for a cup of coffee or a beer. With bicycle parking options now available, I really hope that more people are encouraged to get out and ride! The Cycle Aid Station has already come in handy. How has the feedback been from the community regarding the recent addition of bike parking? Everyone is excited and the racks and cycle aid station/have already been used! Here are a few comments that have been shared with me on Social Media: “Coolest thing I have seen on FB today!! Awesome!!!!" ~R. D.
"Deana Acklin, Market Town thanks you for your hard work at getting this installed!! We needed it ;)". Besides making QUALITY products made in the USA, I have always admired how the company continually works on projects bigger than themselves through bicycle advocacy and by supporting small projects like mine...because it ALL makes a difference. Working with Saris coordinator Emelye was another reason why. From start to finish she was there every step of the way and always shared genuine excitement for my efforts and this project. 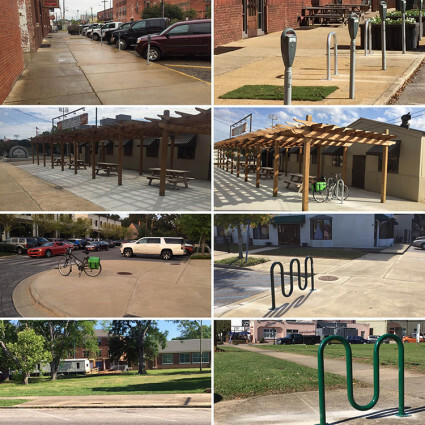 Before and after photos of the new bike parking options in Montgomery. Any valuable information you want to share regarding cycling advocacy projects for others who are interested in adding bike parking to their city? Reach out to your local bicycle clubs and businesses to find the financial support you will need for sponsorship. They may have the same vision but might not have the time to invest in finding the products or mapping them out. Meet with your city planners to discuss your efforts and to share your vision. This way they can advise you on any restrictions or upcoming development that might interfere with your locations. Finally, get the support of your local leaders by sharing with them the benefits of bicycle parking and the positive impact it will have in your community. More before and after photos of new parking options in Montgomery, Alabama.